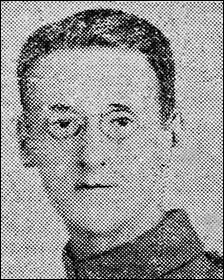 Walter Stuart Griffiths was the only son of ship’s captain Emrys Griffiths and Mrs Griffiths, of Snowdon Street, Porthmadog. He had four sisters. After his education at the town’s Council School and County School, he joined the civil service, where he appeared to be destined for a distinguished career. He was quickly promoted to chief clerk at the Inland Revenue Offices in Newport, after excelling during his early postings to tax offices in Bournemouth and London. He broke off his career to enlist as a Private in the Welsh Regiment. He was wounded in December 1917 and subsequently had a fortnight’s home leave. He returned to the fray and was killed in action on 18 September 1918 while taking part in the advance to victory in the region between the Somme and Loos. Private Griffiths was 21 years old. He was buried in a makeshift battlefield grave which was unidentifiable later. He is commemorated on the Vis-en-Artois Memorial. At the time his widowed mother and his four sisters were living at Aelybryn in Bargoed, in the Rhymney Valley. I’w wlad ei fywyd roes. Who gave his life to his country. That his spirit is with his God.